Hi guys! Gah, I'm going to Cambodia next week! I can't believe the time has flown by so quickly (the holidays will do that to you). This weekend I must start making posts for when I'm gone. I recently mentioned that Michelle from Polish 'M is changing how she releases her polishes. Right now you can't get Class Act (one of the colors I have to show you tonight), but she does have mystery bags on sale which could potentially have Class Act in it. The other color, Lady Liberty, is still for sale on her site, but this won't last for long. If you are interested in it, act now! Come see the swatches after the break. Class Act is a sister polish to the popular Behind the Scenes which I have shown previously. 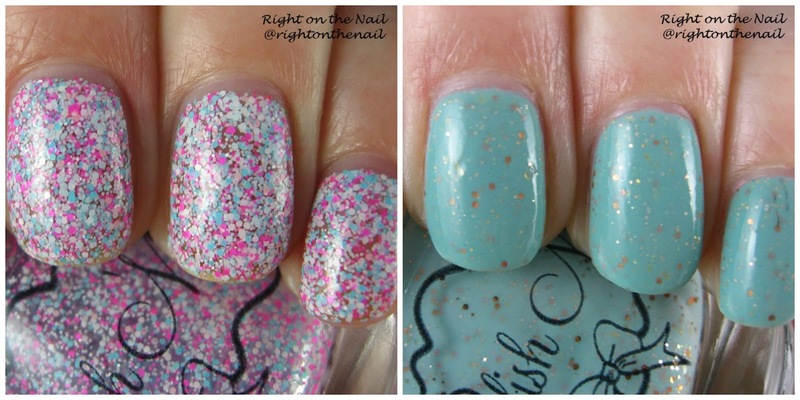 It contains tons of Barbie pink, light blue, and white matte microglitter in a clear base. This baby is full of glitter, so you can get away with 3 coats alone for fully opacity, or 1 really thin coat over a base to wear it as a topper. I need more polishes like this in my life! Lady Liberty is Michelle's most popular polish of all time, and I'm not surprised. It's a minty blue crelly with gold and bronze hexagonal glitter. It definitely has that Statue of Liberty feel to it! This one has less glitter than most of the other Polish 'M colors, but that's fine because the base color is so beautiful. The swatches above show just 2 easy coats. If you enjoy any previously released Polish 'M colors, check out the website to see what's left before the revamp. I, for one, can't wait to see what she has in store for 2016! You can find Polish 'M on their storefront, Facebook, Instagram, and Facebook Group (which I am a part of!) pages.